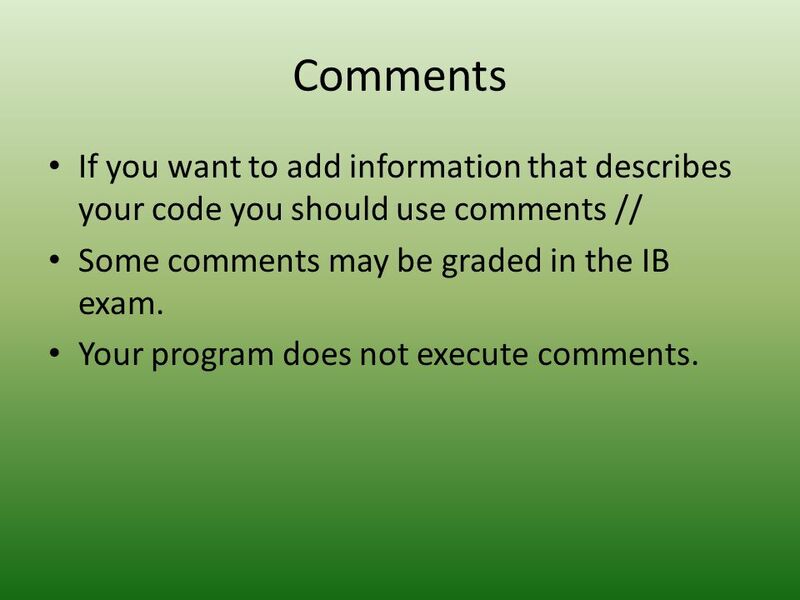 3 Comments If you want to add information that describes your code you should use comments // Some comments may be graded in the IB exam. Your program does not execute comments. 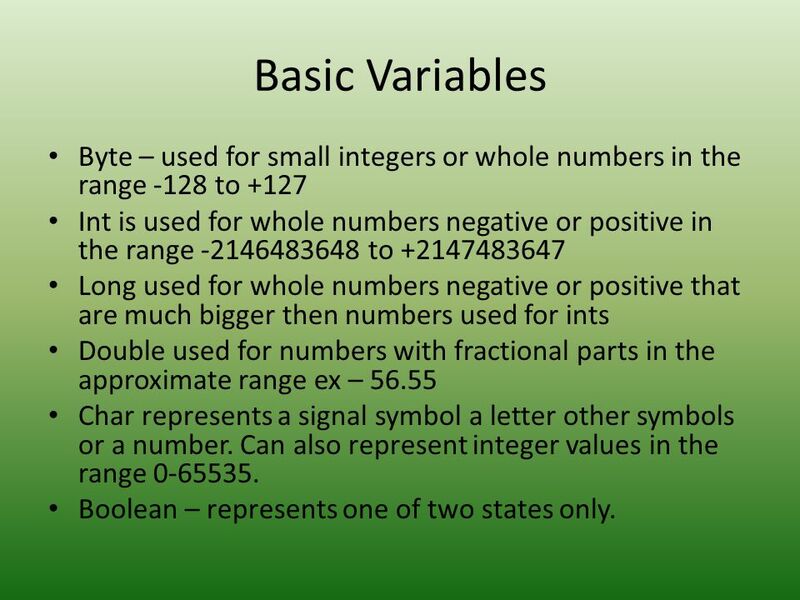 4 Basic Variables Byte – used for small integers or whole numbers in the range -128 to +127 Int is used for whole numbers negative or positive in the range to Long used for whole numbers negative or positive that are much bigger then numbers used for ints Double used for numbers with fractional parts in the approximate range ex – 56.55 Char represents a signal symbol a letter other symbols or a number. Can also represent integer values in the range Boolean – represents one of two states only. 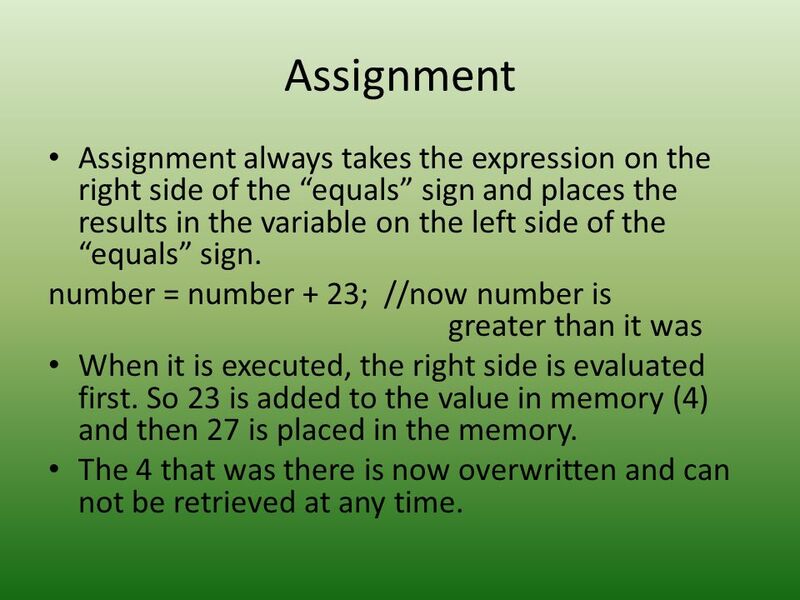 5 Assignment Assignment always takes the expression on the right side of the “equals” sign and places the results in the variable on the left side of the “equals” sign. number = number + 23; //now number is greater than it was When it is executed, the right side is evaluated first. So 23 is added to the value in memory (4) and then 27 is placed in the memory. The 4 that was there is now overwritten and can not be retrieved at any time. 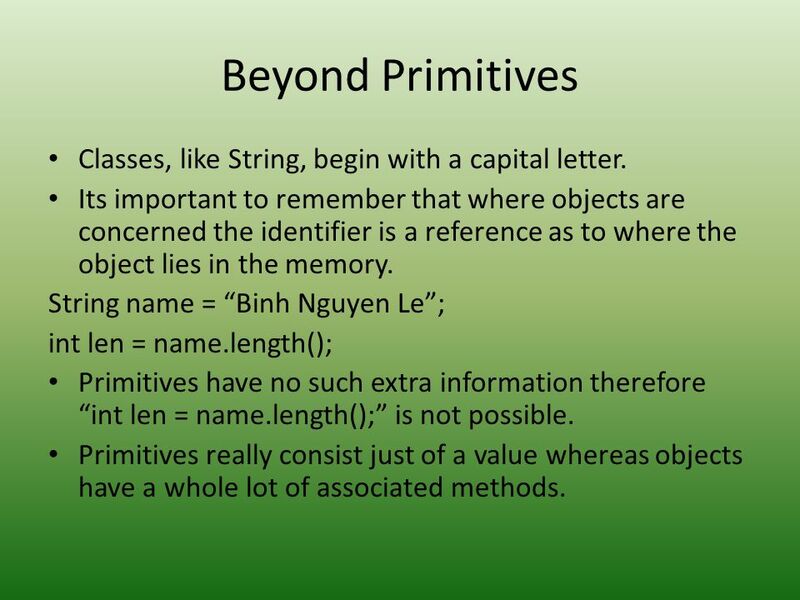 6 Beyond Primitives Classes, like String, begin with a capital letter. Its important to remember that where objects are concerned the identifier is a reference as to where the object lies in the memory. String name = “Binh Nguyen Le”; int len = name.length(); Primitives have no such extra information therefore “int len = name.length();” is not possible. Primitives really consist just of a value whereas objects have a whole lot of associated methods. 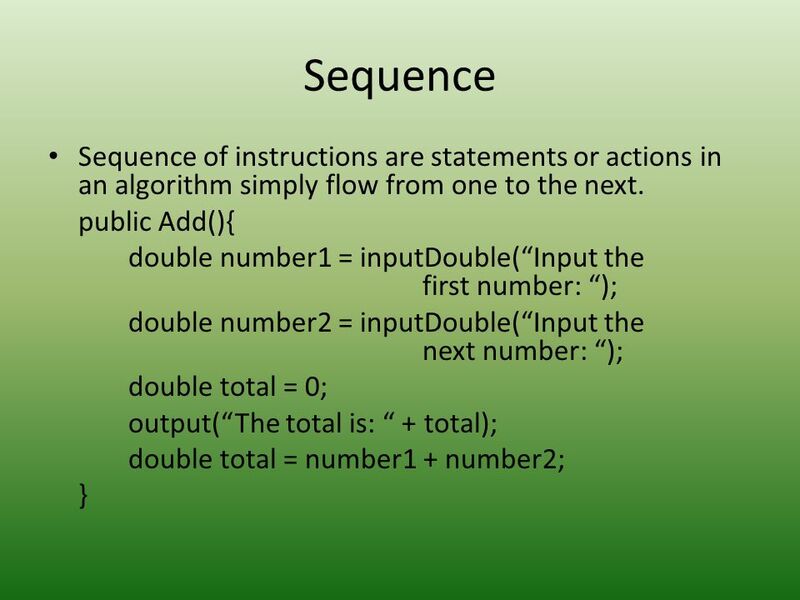 7 Combining String Combining Strings is a simple easily done task in most cases. 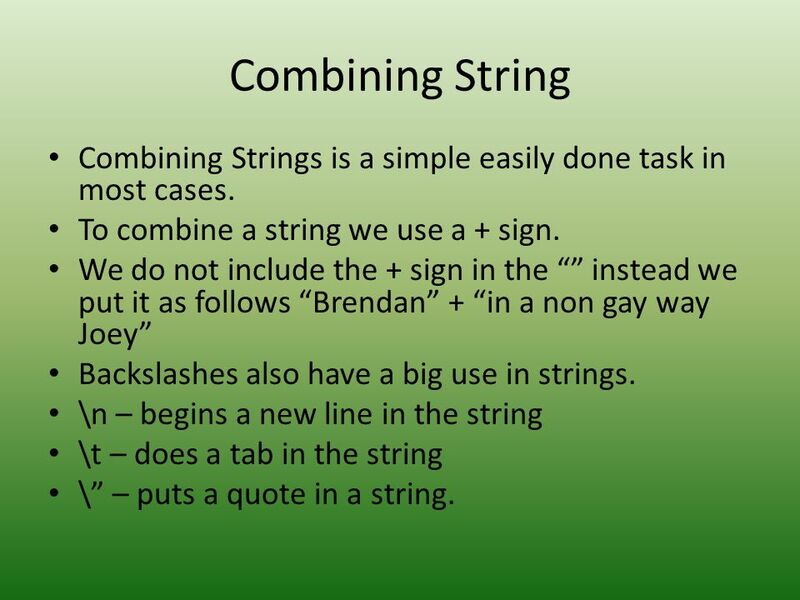 To combine a string we use a + sign. We do not include the + sign in the “” instead we put it as follows “Brendan” + “in a non gay way Joey” Backslashes also have a big use in strings. \n – begins a new line in the string \t – does a tab in the string \” – puts a quote in a string. 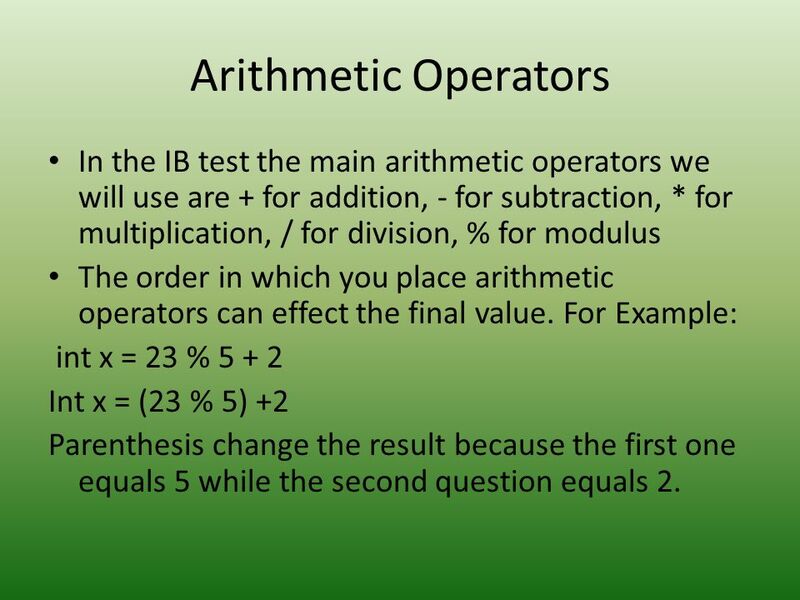 8 Arithmetic Operators In the IB test the main arithmetic operators we will use are + for addition, - for subtraction, * for multiplication, / for division, % for modulus The order in which you place arithmetic operators can effect the final value. For Example: int x = 23 % 5 + 2 Int x = (23 % 5) +2 Parenthesis change the result because the first one equals 5 while the second question equals 2.
double, int abs(x) – Returns the absolute value of its argument (x may be double or int). double pow(x, y) – Returns x raised to the power y. double sin(x) – Returns the sine of x, where x is in radians. double cos(x) – Returns the cosine of x, where x is in radians. Long round (x) – Rounds x to the nearest integer. 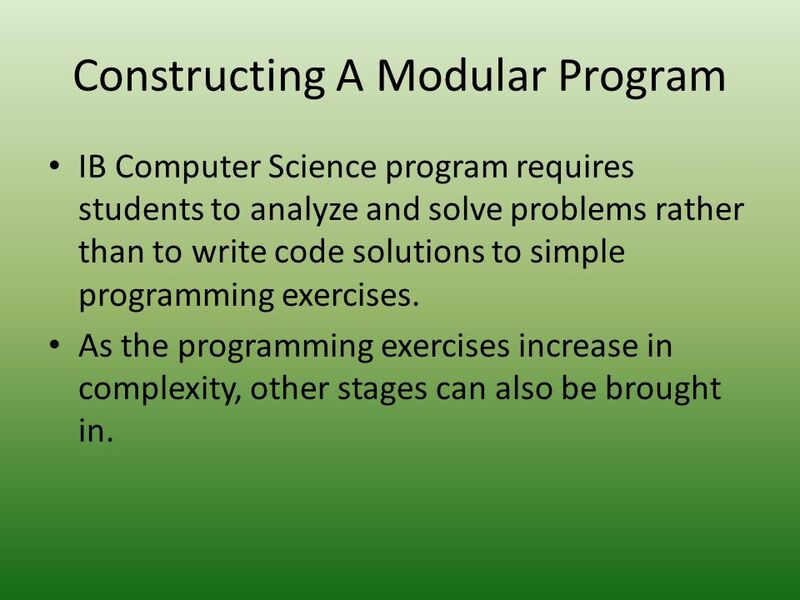 double floor(x) – Rounds x to the nearest integer not greater than x.
IB Computer Science program requires students to analyze and solve problems rather than to write code solutions to simple programming exercises. 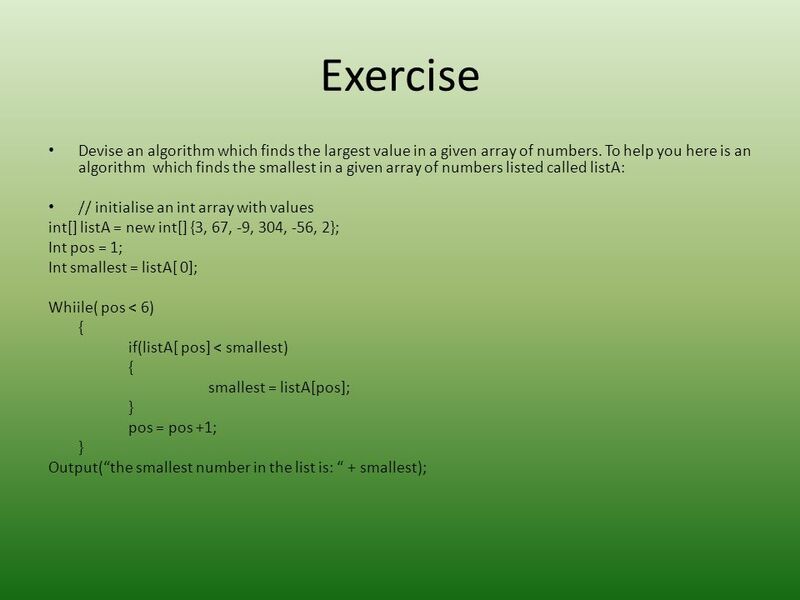 As the programming exercises increase in complexity, other stages can also be brought in. 12 Parameters One way of passing a variable to another method is to use a parameter. 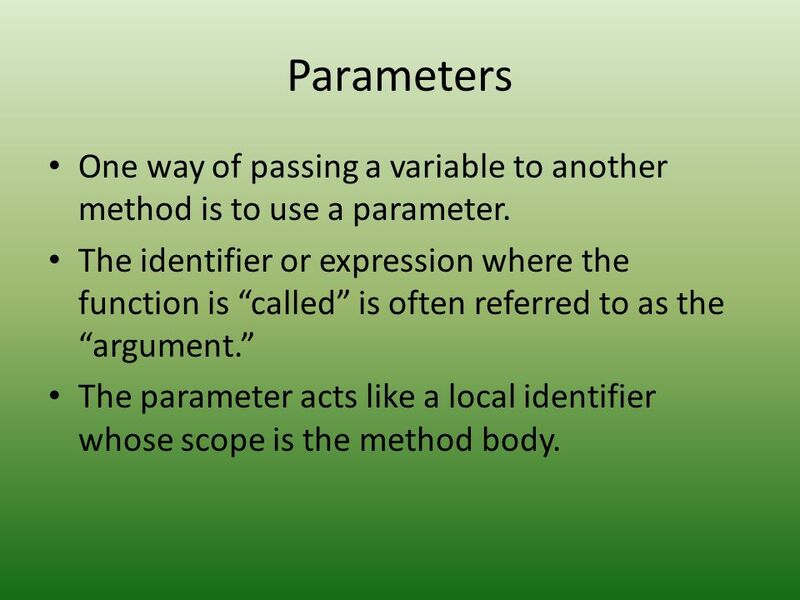 The identifier or expression where the function is “called” is often referred to as the “argument.” The parameter acts like a local identifier whose scope is the method body. 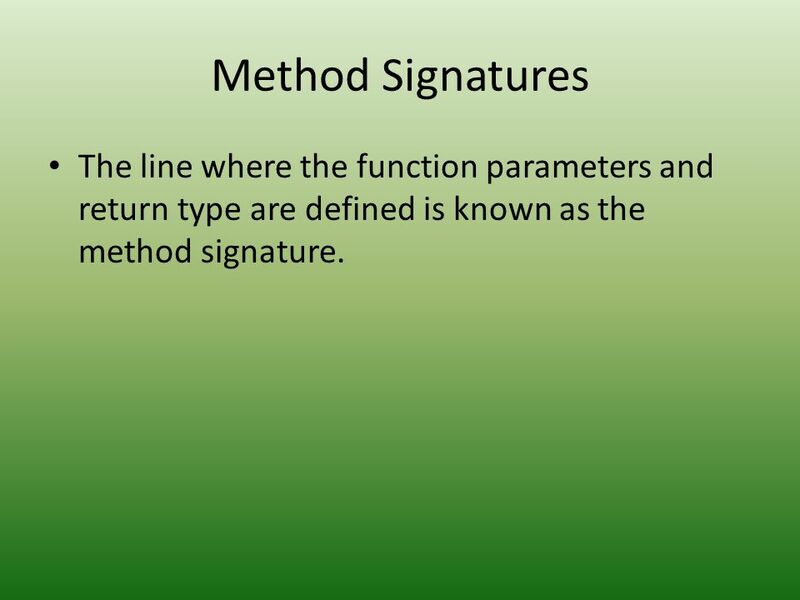 13 Method Signatures The line where the function parameters and return type are defined is known as the method signature. 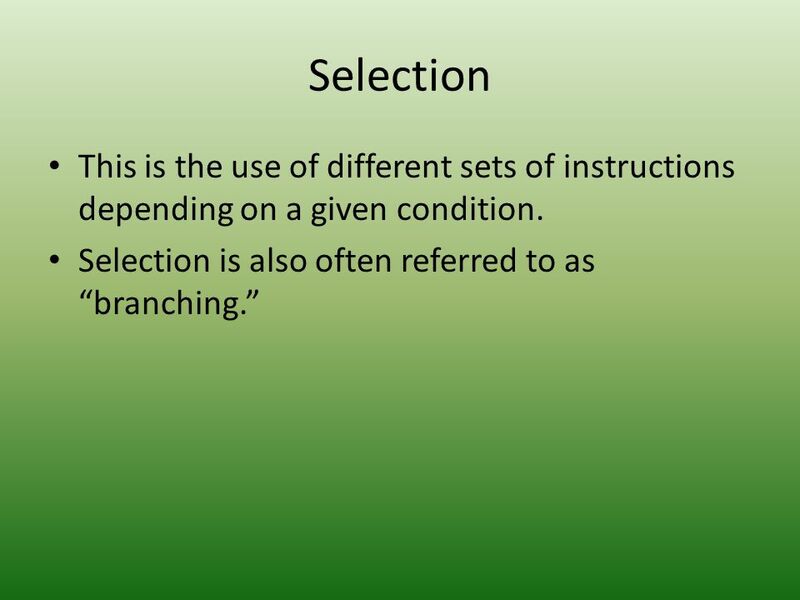 16 Multiple Selections When making multiple selections, if statements can become quite complicated. 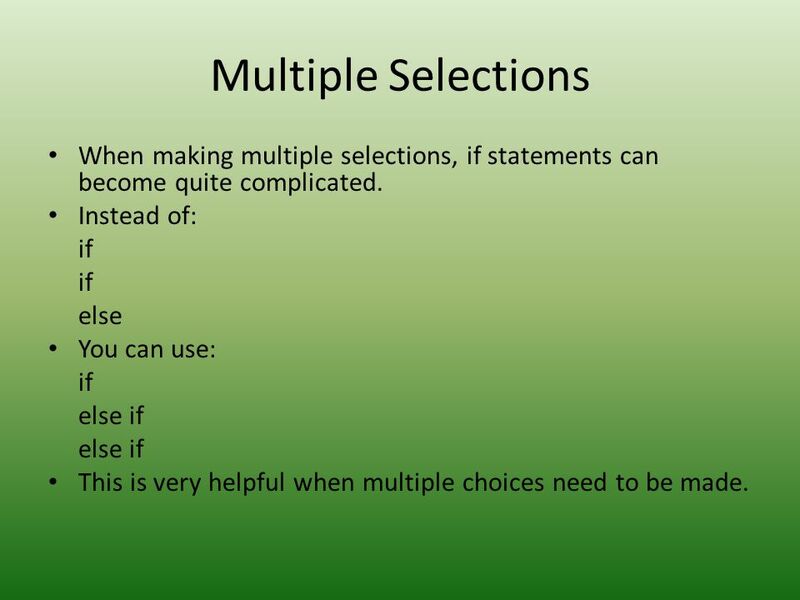 Instead of: if else You can use: else if This is very helpful when multiple choices need to be made. 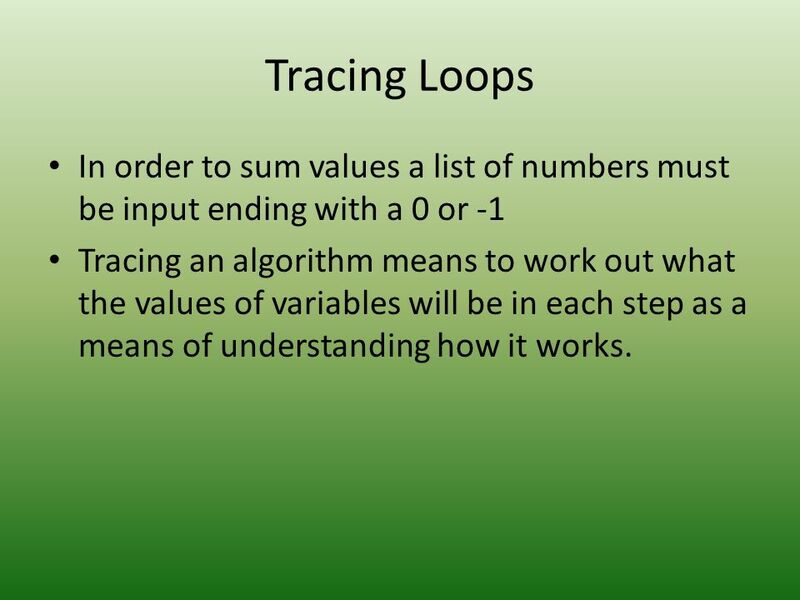 18 Tracing Loops In order to sum values a list of numbers must be input ending with a 0 or -1 Tracing an algorithm means to work out what the values of variables will be in each step as a means of understanding how it works. 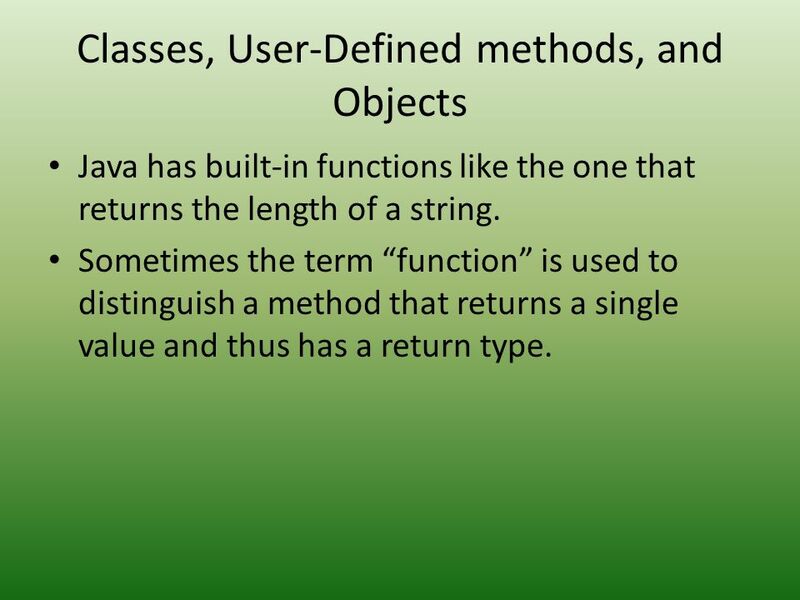 Java has built-in functions like the one that returns the length of a string. 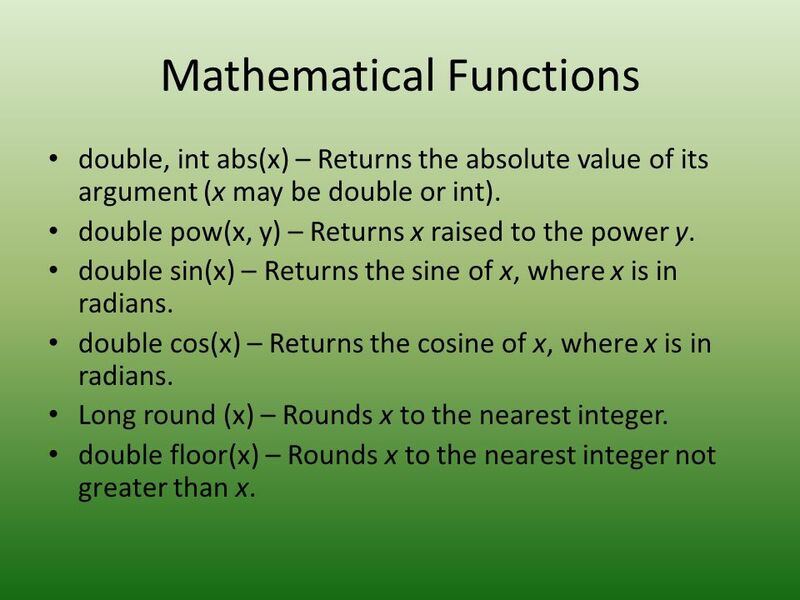 Sometimes the term “function” is used to distinguish a method that returns a single value and thus has a return type. 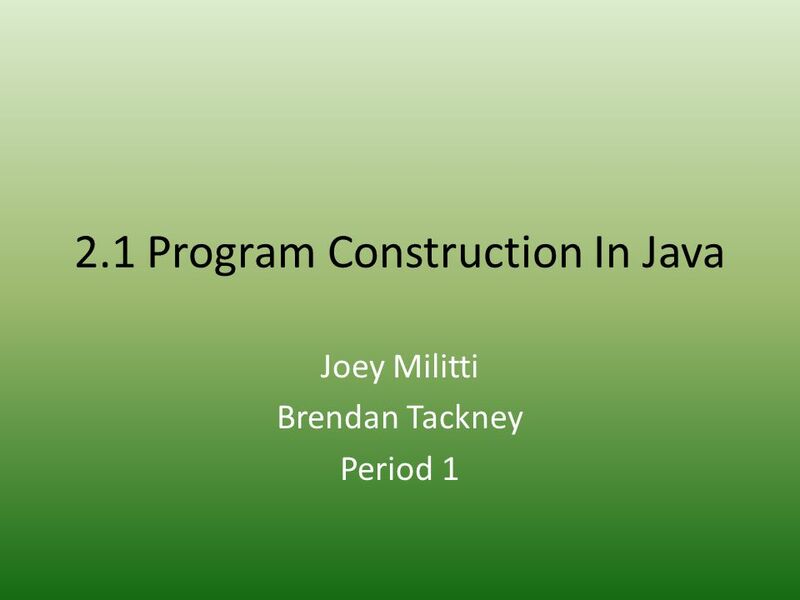 Download ppt "2.1 Program Construction In Java"
AP Computer Science Anthony Keen. Computer 101 What happens when you turn a computer on? –BIOS tries to start a system loader –A system loader tries to. 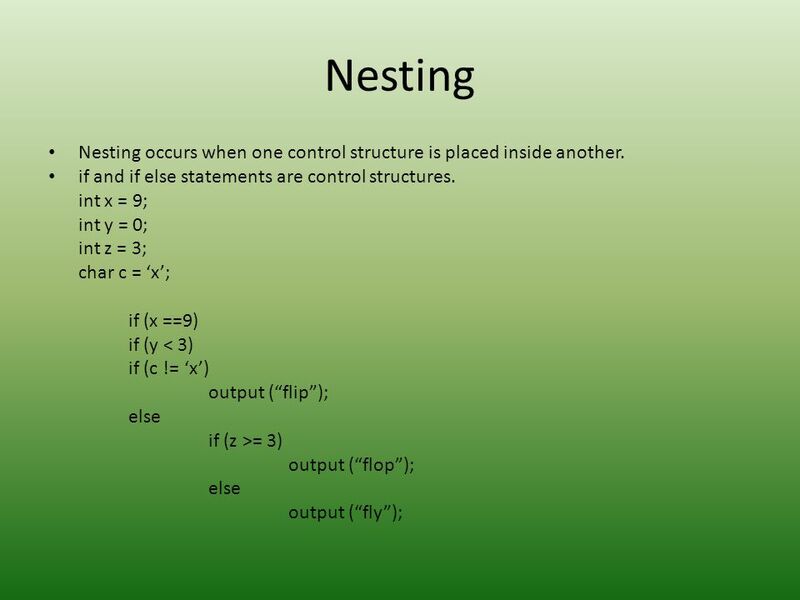 Introduction to Programming with Java, for Beginners Primitive Types Expressions Statements Variables Strings. 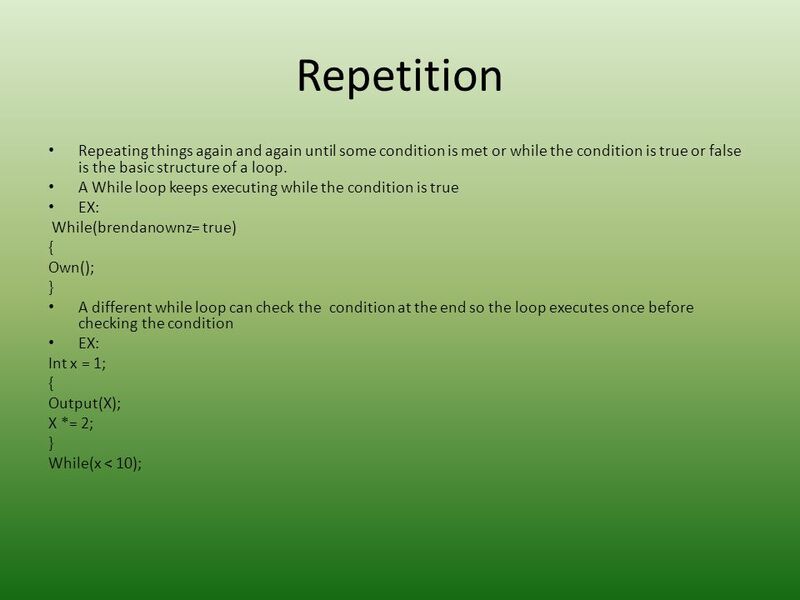 Chapter 4 - Control Structures: Part 1 Outline 4.4Control Structures 4.5The if Selection Structure 4.6The if/else Selection Structure 4.7The while Repetition. ECE122 L3: Expression Evaluation February 6, 2007 ECE 122 Engineering Problem Solving with Java Lecture 3 Expression Evaluation and Program Interaction. CS180 Recitation 3. 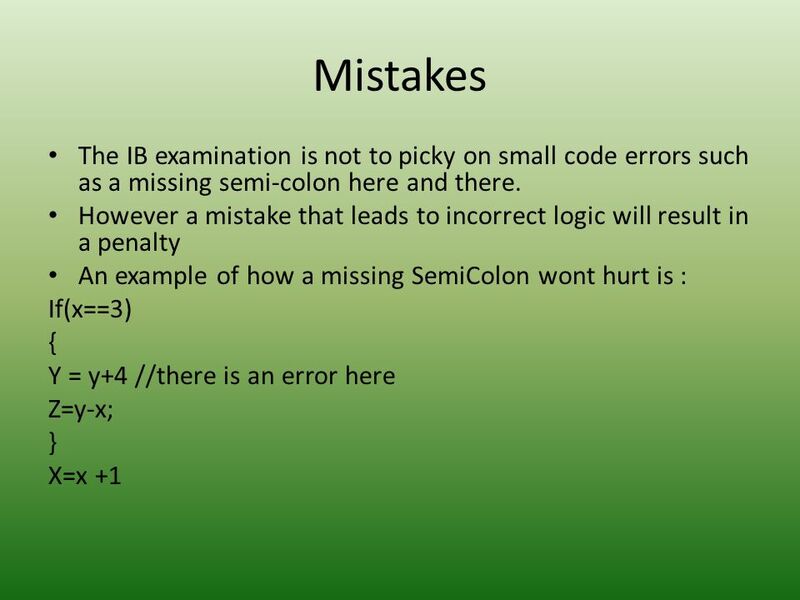 Lecture: Overflow byte b; b = 127; b += 1; System.out.println("b is" + b); b is -128 byte b; b = 128; //will not compile! b went out. COMP 14 Introduction to Programming Miguel A. Otaduy May 20, 2004.